An MLM selling food-related products, including sauces, oils, packets and a range of other items. Tastefully Simple certainly isn’t the first MLM to sell food products but it is the best example of the approach that I’ve seen. In general, the products seem to be fairly decent and the company does a good job of promoting them without going overboard. Despite this, the commission plan for the MLM still has the complexities of a normal MLM, so it’s probably not a good choice if you want to make a decent amount of money. But, for people wanting to make a little money or simply wanting discounts on some products, this might be an appealing option. As the name suggests, Tastefully Simple is focused on food and related products. This particular emphasis is fairly common and it does make some sense. After all, there is growing interest in cooking good quality and tasty food. You just have to look at the extensive number of food blogs out there to see that. However, I’ve always found it a little odd that some direct selling companies choose to focus on food. After all, it isn’t practical for a company to actually sell any of the dishes they promote. Yet, the company’s marketing does heavily play on the senses, making customers hungry for food – even though that isn’t precisely what the company sells. Or, more specifically, the company doesn't sell the actual food that their images imply. Instead, the company sells a collection of products related to food. In particular, they sell many different mixes that you would use to make different foods, like mixes for mug cake or brownies. 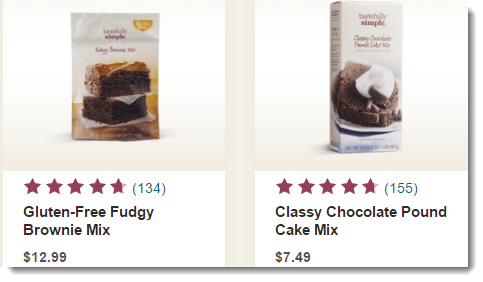 In many cases, these mixes seem to be variations on similar products that you might find in a grocery store. At the same time, there are also other food-related products. These include sauces, spreads, dressings, oils and seasonings. In essence, the company sells food that can be easily stored and shipped (like sauces) along with mixes for food that can’t be effectively sold premade. I’ve seen a number of different companies try a similar approach, but I have to admit that Tastefully Simple does it better than most. For one thing, the product description images tend to be of the containers that you get rather than the food you can make. For example, the bread and muffins section contains images of the boxes and the bags that you buy. Far too often, companies will only show the image of the food, even when it’s actually a mix that they are selling. I find that approach misleading, so it’s nice to see that Tastefully Simple avoids doing that. A second thing that I quite like is that the products actually have a decent number of reviews. 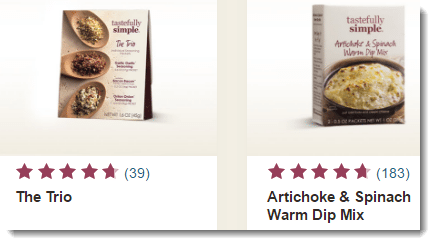 For example, one of the products below has 39 reviews and the other has 183. 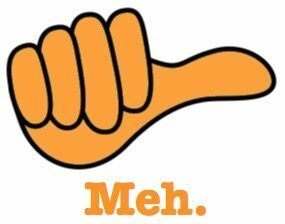 Now, there were products with fewer reviews on the site but even then most products had at least a few reviews. At the same time, most of the reviews were positive, with products averaging somewhere between 4 and 5 stars. Now, it’s very likely that those reviews aren’t entirely accurate. After all, many of the reviewers will be distributors, so they will be biased. Plus, reviews on food tend to be strongly based on personal preference. That makes it harder to get an objective idea of whether the food is any good. Still, the fact that the products have this many positive reviews is encouraging. If nothing else, it suggests that a decent number of people buy the products and that at least some of the purchases are fairly satisfied with them. Another interesting thing is that the company provides recipes which contain their ingredients. They also sell meal collections which contain the products (and recipes) that you people would need to make a set of meals. The concept is kind of cool and might be appealing to someone who isn’t very good at creating their own meal ideas. The final thing to consider about the products is the price. No matter what, an MLM like Tastefully Simple will have products that cost more than the average marketplace value. This is a necessary feature of the type of company. After all, the company has to make a profit and also pay their distributors. In general, the prices of the products are pretty similar to what I would expect. For example, many of the seasonings are $8.99 as are some of the sauces. 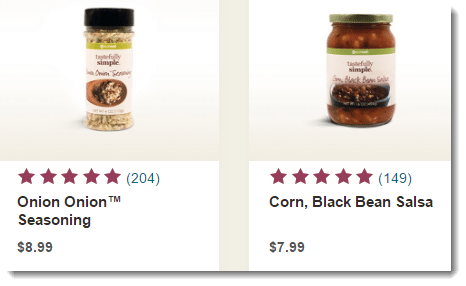 The mixes for food vary a lot more, with some being $6.99 or $7.99, while others are over $12. It’s a matter of personal preference but I imagine that in many cases, the prices would be enough to stop people buying the products every week, but distributors would still make sales. If nothing else, distributors might be more likely to sell the sauces, spices and similar products because in most cases those products will last more than one use. 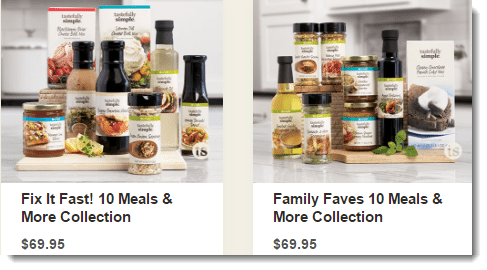 Overall, I think that the products that Tastefully Simple offers are better than most similar companies and may be easier to sell. Nevertheless, there are a lot of places you could go to get this type of product, including grocery stores and specialty stores. That would make the competition quite high. The site for the company doesn’t provide all that much information about the opportunity side of things but one underlying concept is the idea of ordering collections on a regular basis. These are the product sets I mentioned earlier. The cheapest one seems to be a little over $30, but the collections go all the way up to $200. This means that you have to make regular purchases yourself to stay active in the company. At the same time, it also costs $10.95 per month if you want a website with the company. You also need to pay $29.95 per year if you want people to be able to make purchases through the site. In general, the opportunity provides members with 30% commission on the sales that you make. Additionally, you get bonuses from the sales of team members once you reach a certain level of the company. Likewise, you can get various bonuses from meeting certain requirements. Typically, the amount of bonuses you are eligible for increases as your rank in the company increase. That pattern is fairly typical across MLMs. The process of increasing ranks is strongly connected to building your team. So, the general idea is to build a team under you. As this team gets bigger and more successful, you are able to increase in rank. In turn, increasing in rank involves more potential for bonuses and more commissions overall. In most cases, this means that there is a strong connection between team size and profit. The larger your team is, the more profit you are likely to make. It’s also worth noting that the ranks have various requirements. These are connected to your team size and also to how much you sell and your team sells. At the higher ranks, the rank of members within your team also becomes relevant. The overall outcome of this is that it becomes progressively more difficult to increase in ranks as you go along. At the same time, your rank is dependent on the performance of other team members as well as your own performance. This can make it more difficult to get to the higher ranks and to stay there. It is possible to be successful with Tastefully Simple. However, achieving this would involve being good at recruiting people, selling and managing a team. Additionally, you are trying to make money from an approach that is pretty complex and offers most of the bonuses to people who are doing extremely well in the company. Realistically, breaking into this type of company can be pretty difficult and the early stages in the company can involve a lot of time, cost and effort, for relatively few rewards. As with many similar MLMs, Tastefully Simple uses a party-based approach. This means that distributors promote their products in a group setting. Achieving this would involve setting a time and place for a party and then inviting people to attend. 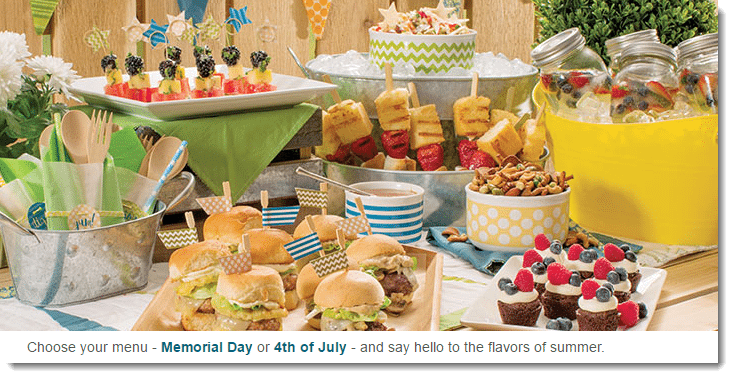 The party environment provides a way to show off the various food products that Tastefully Simple offers. This structure is quite effective for an MLM that uses food. After all, food is a sensory experience. This makes people much more likely to purchase food if they tried and enjoyed it first. So, the parties do act as a good way to get people to make purchases. However, the parties do have a downside as well. Effectively making sales at these parties means that you have to cook and you also have to have the products at hand. Ideally, you would also need to prepare different meals or samples each time, especially if you had the same guests attending multiple parties. Because of this, you would have to have a decent stockpile of Tastefully Simple products at any given time. In fact, it also seems that distributors need to order product sets from the company regularly to even stay active and earn money. Now, in theory, if you make enough sales, you essentially end up getting those products for free (or close to it). But, even so, the approach does affect how much money you can make, because you basically end up getting products instead of money. That might be a good thing if you’re just in the company to get free or discounted products (which is true for some people). However, if you’re actually trying to make a decent income, the amount you have to spend on products can majorly impede that process. Tastefully Simple isn’t a scam. In fact, the products and the marketing make the company seem better than most other food-based MLMs. But, how effective the company is really depends on what you are looking to get out of it in the first place. For example, if you sign up looking to get discounts on the products you buy or wanting to make a little money on the side – then the company may be a good choice. Even with all the competition out there, I can certainly imagine people choosing to purchase the products. But, the idea of making a lot of money through the business is extremely unrealistic. Despite what the company implies, making consistent money is about much more than simply sharing information about the company. Instead, it requires a planned approach and a considerable amount of time and money. An even more significant issue is that making sales and recruiting others effectively requires a pretty specialized skill set. After all, the process of direct sales itself is actually pretty difficult to do and recruiting people into a company is more complex than that. In theory, these are skills that you can learn but the company doesn’t teach them effectively. In fact, you’re likely to get most of your training from the person who recruited you and there’s a good chance that they don’t know a whole lot about how to be effective either. If you’re looking to make a little money on the side, then an MLM may be a great choice. In fact, I think that Tastefully Simple is better than many other MLMs because of its product line and the company may make perfect sense to anyone who loves food. But, if you’re after anything more than that, then this type of company isn’t a great choice. With Tastefully Simple (and the MLM model in general), you have to jump through a lot of hoops to make money and you’re working with a model that has a lot of restrictions and requirements. The various criteria mean that your income potential can decrease from a bad month or two of sales (because your rank drops), or because a member of your team doesn’t perform as well as you hoped. Likewise, you have to buy products regularly, which can be an issue if you are tight on money sometimes. The reality is that the model simply isn’t as good as it sounds. Sure, there is high income potential if you actually get to the higher ranks but most people won’t. There are other models out there that let you make money without all of these criteria and restrictions. One of those models is affiliate marketing. Perhaps the biggest advantage of affiliate marketing is that it is much simpler than what an MLM offers. In particular, there is no complex compensation scheme and you do not need to buy products yourself or physically sell them to other people. Instead, you take advantage of the online environment. That approach makes affiliate marketing much more powerful than the MLM model. After all, people make their purchases online more and more frequently these days. In fact, many MLM distributors are already finding it difficult to make sales because people find better products and cheaper prices online. Not a bad product line, and not a scammy “biz op” that I see in a lot of MLM companies. But as a full time business, this just isn't something I'd recommend. I used to sell Tastefully Simple, and yes, you can make money. You do have to put time and effort into your business. But, if an average home tasting party has $500 in orders, you make 30% of that. And, you do not need to keep stock on hand. Each party hostess gets a party kit which is samples and instructions on how to make them for the guests. If you only have 2 $500 in home parties a month, the consultant makes $300. I think that is a very good amount to make! I still buy their products. We love the garlic garlic, fiesta seasoning, beer bread and the onion onion. So why did you stop? Sounds like a good deal to me. That’s great that you like the product and wanted a discount. But this review was mostly targeted at those looking at a business opportunity. If the products are good and they sell, that’s great. But can you sell enough to make good money? Is the business part of things worth joining? These are the questions I’m answering since my website is about how to make money online.